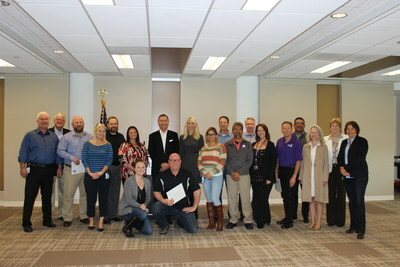 SAN DIEGO, April 9, 2018 /PRNewswire/ -- Bridgepoint Education, Inc. (NYSE: BPI) hosted recognition events in California, Colorado, and Iowa to honor 52 employees who received the 2017 President's Volunteer Service Award from the White House and Points of Light Foundation. The honorees included employees from Bridgepoint Education and its two academic institutions, Ashford University and University of the Rockies. The President's Volunteer Service Award is a national volunteer awards program, encouraging citizens to embody a life of service through recognition. The award is intended to recognize companies and citizens that demonstrate a commitment to community involvement. To receive the award, employees had to donate more than 100 hours to community service efforts during 2017. "Our generous employees have made Bridgepoint Education's community service efforts possible," said Andrew Clark, chief executive officer for Bridgepoint Education. "I am proud of our Bridgepoint Education, Ashford University, and University of the Rockies employees for dedicating their time and effort in giving back to the communities they serve." Bridgepoint Education, Inc. (NYSE:BPI) harnesses the latest technology to reimagine the modern student experience. Bridgepoint owns two academic institutions – Ashford University and University of the Rockies. Together, these programs, technologies, and resources represent a unique model for advancing education in the 21st century. Bridgepoint stands for greater access, social learning, and exposure to leading minds. For more information, visit www.bridgepointeducation.com or www.facebook.com/BridgepointEducation.